Making our selves through from the Mediterranean to the cold central Anatolia was a big change. The roads had been flat enough and nice, but it’s getting colder and colder. Luckily we haven’t had to set our tents, not even a single night, as the people are amazingly hospitable. Snow, Ice in our bottles, and sickness are some of the things he had to endure to finally reach Konya, the capital city of the whirling dervishes. Already on the last days next to the Mediterranean, when we passed and visited Pergamum, Izmir and Ephesus the weather was changing, but at least during the day was warm enough. 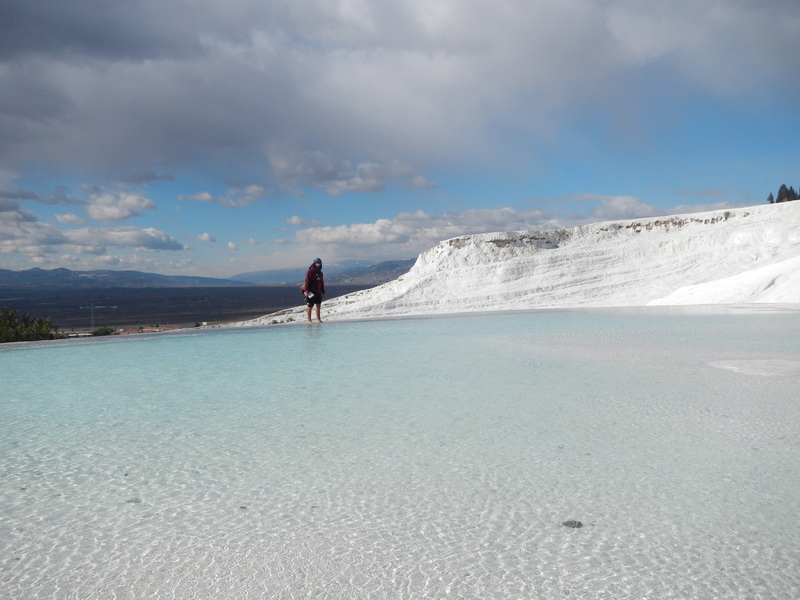 We visited lots of great Greek ruins over these days and even the Pamukkale hot springs national park. All of them were really interesting, and even if at the end meant “cheating” to get on time for the Mevlevi festival, it was completely worth it. Our new travel companion Federico (who we picked up in Izmir) still travels with us. He is not sure where he wants to go, so every day, or couple of days, says that he might take a different route than us… Well, he arrived to Konya! It’s good he is nice and we like him, because it seems we could not get rid of him even if we wanted to. Pamukkalre was one of the most impressive things we saw on this route. From the distance it seemed snow, but then when you get closer you see that are rock formations that create natural pools. And with the warm water it keeps it from freezing … for the most part. We decided to start the visit from below, and as it’s protected you have to take your shoes off. We thought the water would be warm everywhere, but unfortunately we were wrong! We had to walk barefoot for a few hundred meters on ice and really cold stone. But as the top part is warm, we were able to feel our toes once again before putting our shoes back on. On the top the ruins of Hierapolis are really impressive, but they are so big we were able to see just a tiny part, as we decided to hike back on the road. No way were we going to go down the ice and stay with frozen feet for the rest of the day. The rest of the days were quite eventless but really interesting. We would start pretty late, because with three people (one of them an Italian), it’s hard to get everything ready. We were lucky with the weather and even though it was getting colder (some days with a maximum temperature below 0), it was sunny and we could enjoy the half snowed landscape. Around 4pm when the sun started setting and the temperature dropping, we would head to a town and ask people if they could host us. And every day they did! Sometimes by Imams from which we learnt lots of things about Islam and religion in Turkey, but also by younger people with whom we talked more about everyday stuff. It’s a pity that we don’t speak more than a few words in Turkish, because the people are so nice and friendly that it would be great to have a normal conversation. If I had known that I was going to stay so long in this country I would have started learning Turkish earlier, but I think it’s never late, so I just started from the very beginning, so let’s see how far I get in the remaining month. With 2 days stopped there was no way we would have made it for the 16th by bike to Konya, so we hitchhiked for a part, and we took a bus for the rest. At the beginning for the trip I was quite against taking other transports, but I think I’m over that now. So we will stay in Konya for a few days, enjoying what the city can offer and learning about the Mevlevi Sufism.